Make up batches of the spiced infusion in advance and keep in a sealed container. Then all you'll need to do when your guests arrive is to add it to the wine, heat through and serve. Crush the cardamom pods lightly and remove the seeds. Grind coarsely in a mortar with a pestle or between two spoons. Place in a small pan with the rest of the spices and the vodka. Heat gently until just simmering. Remove from the heat and leave for at least an hour to infuse. Strain the spiced vodka and put into a large clean pan. Add the wine and sugar and heat gently until the sugar dissolves but don't allow to boil. 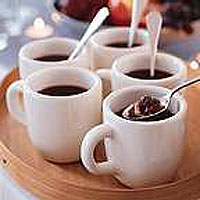 Serve in cups or goblets with a spoonful of almonds and raisins.